Just a short walk from the Heidelberg train station, along the iconic Burgundy Street, is a fantastic cafe popular amongst many locals within the area, a cafe that truly deserves some well earned recognition across the wider community. 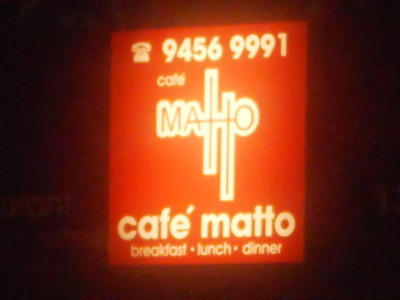 That cafe is Café Matto. Café Matto is primarily an Italian and Mediterranean restaurant, with a few surprise dishes added onto the chef's recommendations to broaden its menu, making it appealing to even more tastebuds. 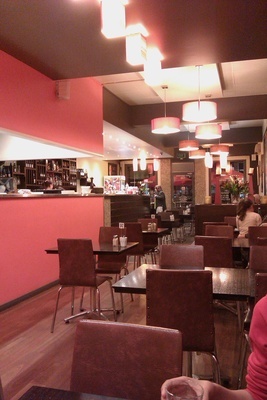 As Burgundy Street has been receiving its various upgrades over the past years, so too has Café Matto. As you walk through the front door, it's hard not to have a feeling that this café is a welcoming café. You're instantly greeted with a warm smile and friendly customer service. Additionally, on the front cover of the menu is five points stating the "Things you need to know about us". And, after looking at point number three, you instantaneously know that this is a restaurant for all age groups. After talking with the proprietor, Jim, it has come to my understanding that Café Matto has been a part of Burgundy Street for the past five years. Café Matto has been making it's presence known within the suburb of Heidelberg, receiving an own upgrade approximately twelve months ago - making it a modernistic café with colourful feature walls and good lighting ambience that just simply gives you that true relaxing feel. Café Matto's menu and the chef's recommendations include a range of dishes which will appeal to all tastes, whether it be for breakfast, lunch or dinner. As well as having the chef's recommendations change every ten days, this restaurant provides it's patrons with some good meal selections for the individual dining experience. Also, with no dish costing more than thirty dollars, Café Matto proves to be a family welcoming restaurant with very affordable prices. So why not go and experience Café Matto yourself and allow Jim and his team welcome you into the Matto dining family.